Hackers are targeting Google users' passwords in a new advanced phishing scheme that is difficult to detect and block, security experts at the firm Bitdefender said on Tuesday. The attack began a couple of days ago and has managed to spread fast, said Bianca Stanescu, a security specialist at the firm. "We haven't spotted this type of phishing attack. It's enhanced, usually the security solutions block the webpage for malicious activity before users open it, but this time security solutions receive the encoded content and they can't really block it." The scam starts with an email that claims to be sent by Google with the phrase "Mail Notice" or "Lookout Notice" as the subject. The message in the email reads: "This is a reminder that your email will be locked out in 24 hours, due to not being able to increase your email storage quota. Go to the INSTANT INCREASE to increase your Email storage automatically." A link then redirects the user to a bogus Google login page where the user is prompted to put in their credentials. 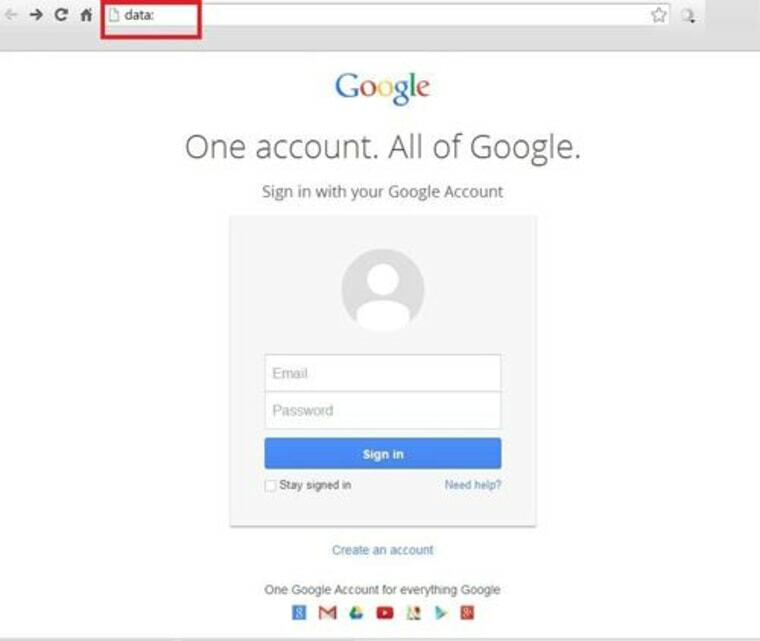 Once the hackers receive the credentials they have access to not just a victim's email, but to all Google documents, Google Play, Google+ and if the person uses the same login information for multiple sites, the hacker will also have access to those. Google has not yet responded to a request for comment. What's unique about this particular attack is not only how legitimate the emails appear, but also how the phishing attack is structured. The attack is based on the uniform resource identifiers (URI), which are the subsets of characters that make up a URL. Most browsers limit the amount of data that can be in a URI, which makes phishing attacks easier to identify because of how long they can be. But because Google's Chrome browser doesn't display all the information in a URI (making it appear shorter), it makes the dangerous phishing link harder to notice. This specific URI attack shows "Data:" in the Web browser instead of "Https:" which indicates that the Google site is not a real one, Stanescu said. While Chrome is most vulnerable to this particular attack, Firefox Mozilla's browser is also affected, Stanescu said. Bitdefender has reached out to Google about the phishing scam and expects the company to have a patch in place soon to help block users from accessing the site, she said. However, blocking dangerous sites doesn't mean the threat dies. "We are constantly collaborating with Facebook, Google and other institutions and letting them know that this is going on. But by the time they block them new ones are created," Stanescu said. Internet users need to be skeptical when they receive an urgent email from someone they don't know or a reputable institution and should also use strong passwords and two-factor authentication to help avoid these kinds of scams, she added.